This is a guest post from Natalie, a friend of The Family Gamers. Qwirkle is a colorful tile laying game of patterns. It was created by Susan McKinley Ross and supports 2-4 players ages 6+. A game takes between 30 and 45 minutes. Qwirkle is somewhat similar to Scrabble or Bananagrams. Tiles are placed in vertical or horizontal lines and each line that connects must follow the game rules. Instead of letters, however, the game contains six symbols in six different colors. With three of each type, there’s 108 tiles in total. Setup in Qwirkle couldn’t be simpler. There isn’t even a board to lay down! Place all tiles in the carry-bag. Each player takes six tiles out of the bag and keeps the symbols on them hidden. Each player announces the largest group of tiles they can play, either in the same color or the same symbol without duplicates. Whoever has the highest number begins. If there is a tie, the oldest player begins. The first player plays their largest group of tiles in a line. Play continues clockwise. The next player adds to the play area by playing tiles that must intersect either horizontally or vertically with the existing tiles. The newly placed tiles cannot cause repetition of either color or symbol depending on what pattern the line is following. For example, if the line’s pattern is all the same symbol, there must be only one in each color, with no duplicates. If the line’s pattern is all the same color, then there must be only one of each symbol, with no duplicates. Any other tiles the player’s line touches must also follow these rules, or tiles cannot be placed there. Players score one point for each tile played, plus any adjacent tiles, at the end of their turn. If a player adds to an existing line, that entire line scores as well. 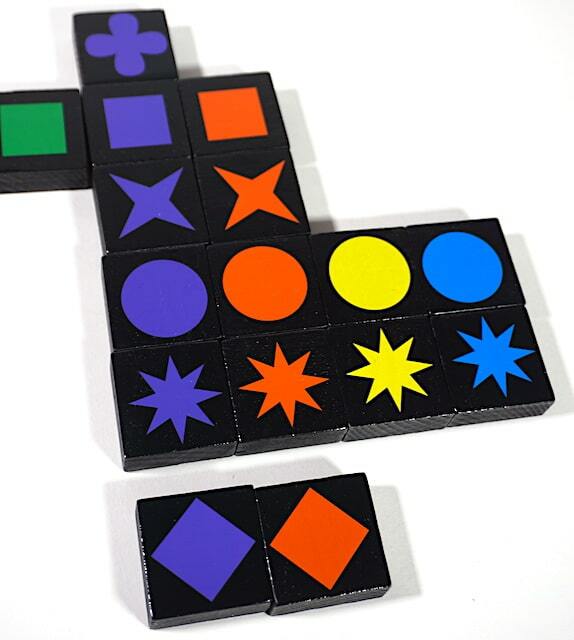 Players score a “Qwirkle” whenever they complete a line of six tiles with no duplicates (color or shape). It doesn’t matter if they complete an existing line or create a new one with all six of their tiles.. This gives them an additional six points in addition to their tiles scoring. Once a player plays their tiles, they refill to six tiles from the draw bag. When the draw bag has been depleted and one player completely runs out of tiles the game is over. The player with the most points wins. There is a bit of strategy involved when considering whether or not to play certain tiles. For instance, you may not want to play the fifth tile in a sequence if you do not also have the sixth, so that another player can not play a single tile to form a “Qwirkle”. They might, then, play their piece before you, allowing you to form the “Quirkle” and collect the bonus points. The drawback is that playing less tiles results in less points per turn. I found holding out on people kind of fun. Qwirkle with these 2 tiles for a total of 19 points! Qwirkle has simple mechanics. If you enjoy games that are on the simpler side, or are looking to play with younger players, Qwirkle may fit the bill. It was easy enough for my 6 year-old to play, but complicated enough for adults to enjoy when getting into strategy styles. The contrast of bright colors painted on black wooden tiles adds some interest for younger children as well. As with many games, Qwirkle does suffer a little bit when playing with widely different ages. Qwirkle doesn’t require domain knowledge, so it has a leg up on word based tile-laying games. But a young child is not going to be able to weigh all their possible different moves to determine which would score higher amounts of points. Adults will place their tiles more strategically, and possibly even count tiles for an advantage. We balanced this discrepancy by allowing each of our two children to play their own tiles and turn, but they were also on a “team”. We combined their scores, and they could help each other make better moves or make a “Qwirkle”. The kids enjoyed teaming up against the adults, and we enjoyed a more difficult game. Their combined score actually beat each of us, but it was close. We would have left them in the dust, otherwise. If there are four children around the same ages playing, or four adults, this handicapping wouldn’t be needed. You can find Qwirkle in most stores that sell games, including Amazon, for just under $25. The price is not outrageous considering the quality of the game pieces, but I would like to see it priced closer to $20. Mindware provided The Family Gamers with a complimentary copy of Qwirkle for this review.